LONDON--(BUSINESS WIRE)--Technavio’s global varactor diode market research report projects the market to grow at a CAGR of approximately 11% during the forecast period. The growth of the FM broadcast market will be one of the major trends in the global varactor diode market during 2019-2023. The receiver uses a VCO, which is integrated with a varactor diode to achieve the desired carrier frequency during an FM broadcast. The use of these receivers in smartphones, cars, and FM radios is increasing due to the growth of the FM broadcast market. This is anticipated to promote the demand for varactor diodes during the forecast period. 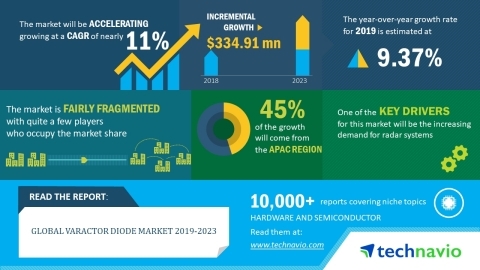 Technavio’s global varactor diode market research report projects the market to grow at a CAGR of approximately 11% during 2019-2023.